Today's post is from our newest blogger, BobbyC. Bob is an accomplished cook and homebrewer... oh, and he's family. We known you'll enjoy his recipes and insight. Welcome BobbyC! Pasta dinners are always a nice standby. Our pantry is never without 3 or 4 varieties of dried pasta and a jar or two of tomato sauce. Grab some meat and some good bread, and you've got a quick and tasty dinner. Lately, I've grown tired of tomato-based sauces and have started exploring the basil-y world of pesto. So, as the end of Friday approached, I started thinking about dinner. I had more basil than I knew what to do with and some really tasty spiral vegetable pasta we found at the food co-op. A quick stop at the grocery store for some Italian sausage and a fresh loaf of bread and we're ready to roll. 1. 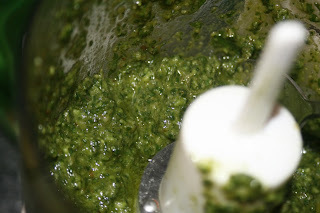 Put basil, parmesan, nuts, garlic, & olive oil into a food processor, then process. 2. Keep tasting, adding olive oil to adjust consistency, adding salt & pepper to taste. 3. 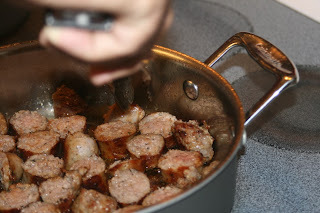 Put the sausage on medium-low heat to start browning. 6. For the bruschetta, just cut the loaf of bread on the bias and rub with a garlic clove. Drizzle some olive oil over the top, then place 1 basil leaf and the largest slice of roma tomato the bread can handle. 7. Place the bruschetta in the oven and just pull it out when it starts browning around the edges. Somewhere around 10-15 minutes. 8. Cook the pasta to al dente, then drain. I always mix a couple spoonfuls of the sauce, plus a touch of olive oil into the pasta -- just enough to coat, then allow whoever is eating it to add more if they'd like. 9. 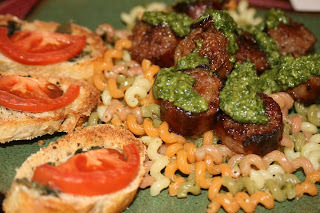 Slice the sausage, pile it on top of the pasta, add pesto on top of that. If I were to do this one again, I think some diced roma tomatoes mixed up into the pasta would have helped. Thanks to my beautiful wife (of 1 year now!) for taking these pictures. mmm, sounds good. Your mom sure did a good job in getting you started cooking!